If you’ve followed all the training plans and you’re looking for that extra ‘edge’ it’s tempting to seek out the ‘magic bullet’ that will take those last few seconds off your pace. There is a long list of substances that are, or have been, promoted as performance improvers; some are legal and others are not; some have scientific evidence of their benefit and others do not. A word of caution, relating to all supplements, that is prompted by a Food Standards Agency warning received recently. (The FSA bulletin related to OxyElite Pro and VERSA-1, promoted for weight loss and body building; manufactured and sold in the US but available here via the internet.) If you decide to buy any supplements, whether dietary or performance related, please ensure that you purchase them from a reputable source. Internet prices can be very attractive but the larger manufacturers and suppliers, such as the well-known high street names, generally have better and more reliable quality control measures in place. This entry was posted in Supplements - sports performance and tagged Supplements on November 28, 2013 by Mary. 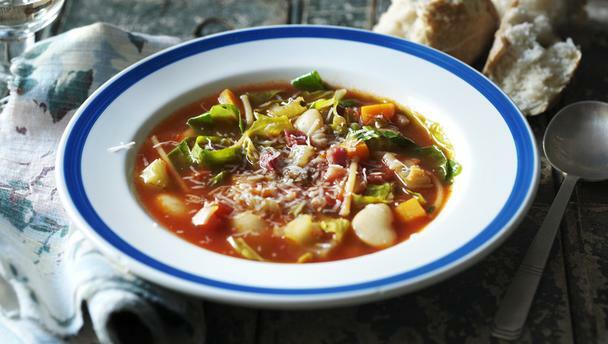 This hearty Italian soup is made with pasta and beans and finished with a generous sprinkling of parmesan. Put a large frying pan over a low heat, add the lardons and cook for 10 minutes until crisp, golden and the fat has run from the meat. Transfer onto a plate. Tip the carrots, celery and onion into the bacon fat and fry for two minutes before adding the garlic, herbs and tomato purée. Cook for one minute, then add the tomatoes and most of the stock. Bring to the boil. Carefully transfer the soup to a slow cooker, cover with the lid, then cook on high for four hours until the vegetables are tender. Stir the beans and pasta into the soup, adding the rest of the stock if it seems overly thick. Scatter the shredded greens over the top of the soup, then re-cover with the lid. Cook for 30 minutes until the pasta is tender. Stir in the greens, season to taste with salt and freshly ground black pepper, then serve in bowls with a drizzle of oil and plenty of parmesan. This entry was posted in Recipe and tagged Vegetables on November 19, 2013 by Mary.